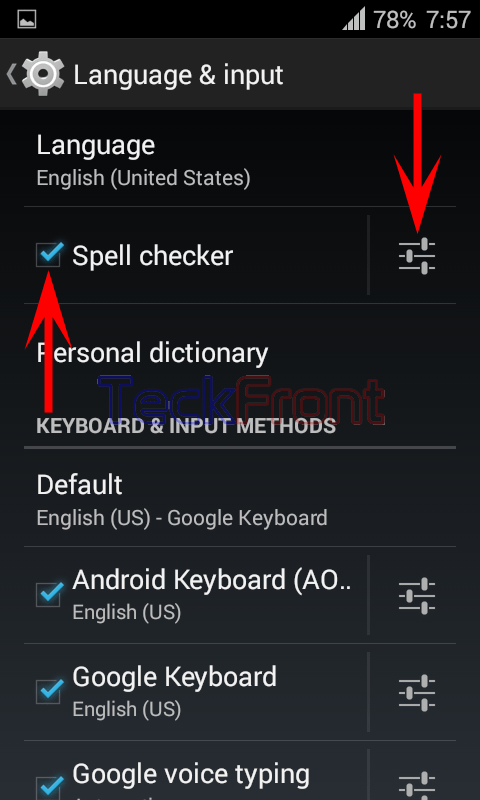 How to Enable Spell Checker for Messages in Android 4.4.4 KitKat Device? Spell checker plays an important role if you want to write good English in Messages. Without the spell checker, information conveyed through messages, may be distorted rather misled due to wrong language and spelling mistakes. Almost every message user and sender feels need to check for the spelling correction. Android 4.4.4 KitKat, like many other new era operating systems, has a feature which can check the spelling of the message. You may enable the spell checker in your Android device by following these instructions. Command Line: Settings – Home > Language & input – PERSONAL > Language & input. 1: Follow the Command Line to open up the ‘Language & input’ screen at your Android 4.4.4 KitKat device. 2: See the ‘Spell checker’ is not checked, i.e. not disabled. Settings button is also not enabled, i.e. you cannot make further settings in it. 3: Tap the ‘Spell checker’ to check, i.e. to enable. 4: See the ‘Settings’ button of the ‘Spell checker’ is now enabled, i.e. you can further set the spell checking options. Newer How to Choose Android or Google Spell Checker in Android 4.4.4 KitKat Device? Older How to Choose System Language for Android 4.4.4 KitKat Device?